Move your customers from "satisfied" to "LOYAL"
What do your customers really think of you and your service? How effective are your verbal and written communication skills? Do your customers GET YOU? Are you getting in front of them, even when you can’t be there? 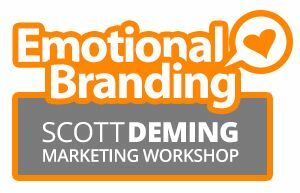 Emotional Branding: The Ultimate Customer Experience Workshop will show you how to become a better communicator and a more effective “zero cost” marketer. This workshop will help you to have a greater understanding of your customer’s expectations, their perception of you, and ultimately how to move a customer from satisfied to loyal. This program is interactive and participatory, using case studies, role playing and exercises. You will learn how to focus on the needs, desires and expectations of your customers, as you create unique selling propositions, marketing campaigns and purpose in your proposition. Join us at the newly refurbished Marriott Syracuse Downtown (formerly Hotel Syracuse) for a motivational workshop that will change how you do business. Start with our complimentary breakfast and networking at 8 a.m.
Scott Deming takes his thirty plus years of business ownership, board positions, working with small, independently owned companies as well as multi-national, publicly traded corporations, employee relationship expertise, customer experience savvy, and wraps it into the most comprehensive, easy to implement, and energetic program you have ever seen. Scott Deming is a seasoned sales, communications and marketing professional with over thirty years of corporate experience, board positions, and business ownership, including over twenty years as owner/operator of a national advertising and marketing firm. Scott has worked with multi-national corporations, as well as mom and pop companies across the globe, both in business to business and consumer brands, helping them to differentiate, decommoditize, become more productive, profitable and sustainably successful.